Today's post is sponsored by Entenmann’s® Little Bites®. The opinions expressed in this post are my own and do not reflect the opinions of Entenmann’s® Little Bites®. Can you believe that it is June already? June usually means that school is over for the year, and summer is about to officially begin. It also the month we celebrate the important fathers in our lives. Father's Day is on June 17th this year. As we gather those gifts and cards that show dad how much we appreciate him, you can't forget the simple things. A meal is a great way to show love and it doesn't have to be over-the-top, especially when you want the little ones to be involved. 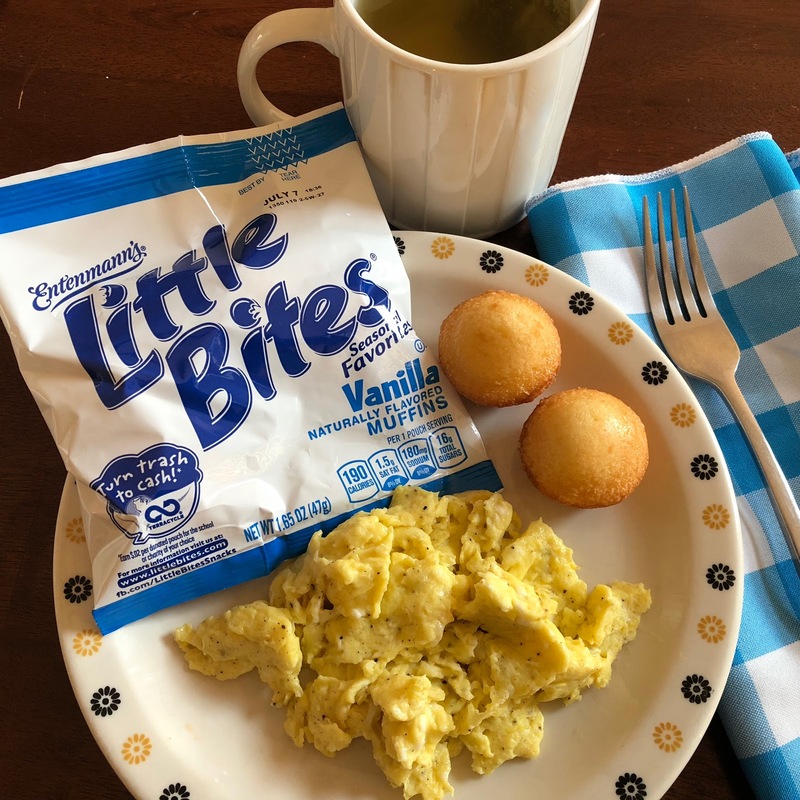 One of the easiest breakfast ideas is scrambled eggs with a pack of Entenmann’s® Little Bites® Vanilla Muffins. Serve this with a cup of coffee, tea or juice and you will see a big smile on dad's face! Entenmann’s® Little Bites® Vanilla Muffins are here for a limited time, so you must 'scoop up' a box or two so you can enjoy the deliciousness for yourself. They are my family's favorite new flavor. They are the perfect choice as a quick breakfast on-the-go, as a lunchbox snack, or as an anytime snack. They come in portioned packs that have 190 calories per pouch, contain no high fructose corn syrup or trans-fat, making them a snack kids will love and a choice parents can feel good about. 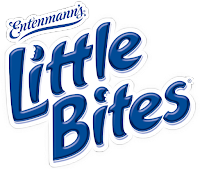 Entenmann’s® Little Bites® is thanking dads for all that they do by giving away Entenmann’s® Little Bites® ties and a coupon to purchase the beloved snack to 10 lucky guys. Five extra lucky dads will win the Little Bites® tie, a coupon AND a $100 Amazon gift card! 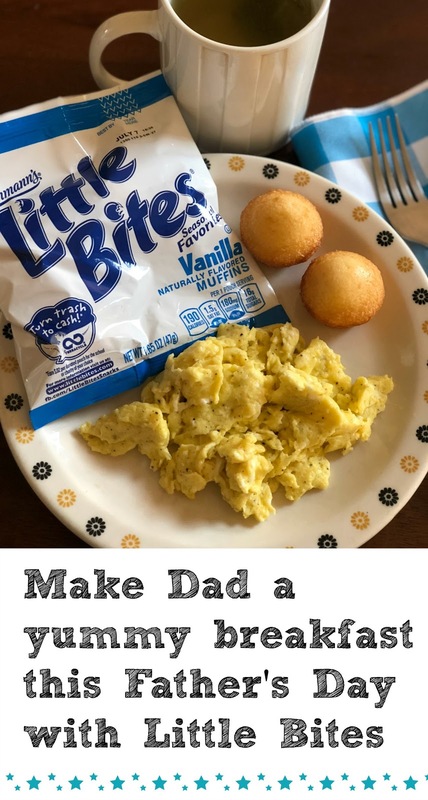 From June 1-15, 2018, simply go to https://www.littlebites.com/recipe/little-bites-hole-one-father-s-day-fun to enter the Love Little Bites Father’s Day Sweepstakes for a chance to win one of the exciting prizes! In time for Father’s Day, what better way to celebrate Dad than by creating a deliciously edible “hole-in-one” featuring Entenmann’s® Little Bites® Vanilla Muffins? You can view the Little Bites Hole-in-One Father’s Day Fun DIY video here for step-by-step instructions here. This giveaway is open to U.S. Residents only and ends on June 15, 2018. Must follow rules in Rafflecopter. One winner will be chosen randomly. Mom Files is not responsible for any lost or stolen prizes. Good luck! I like the crumb cake variety, especially when warmed a little in the microwave. 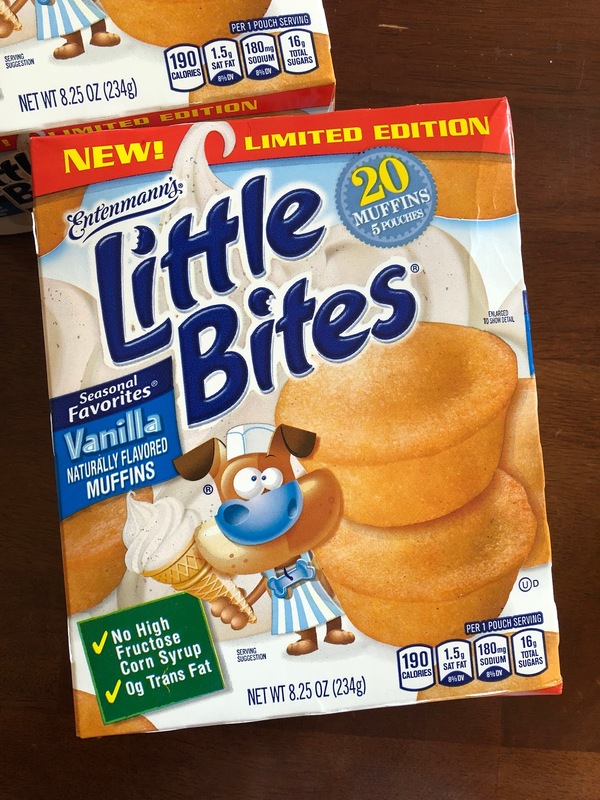 I love the Entenmann's Little Bites snickerdoodle muffins. The blueberry muffins are great with a cup of coffee in the morning. My favorite are the Chocolate Chip Little Bites. I'd enjoy chocolate chip the most. My favorite Entenmann's Little Bite flavor is blueberry. I love Little Bites blueberry muffin. A cup of Java and a few blueberry muffins, YUM! I love the party cakes! My favorite flavor is the blueberry. I love the brownie bites. My favorite is the Little Bites banana muffins! I love the Seasonal Entenmann's Little Bite's varieties, but we all enjoy the Chocolate Chip flavor also. I like Entenmann's Little Bite's Chocolate Chip. We have 2 favorites with my 5 kids. Some like the blueberry muffins and the others the chocolate chip. Blueberry is my favorite little bites. My boys love the Chocolate Chip Little Bites Muffins. We love the blueberry muffin ones. There so good. I love the blueberry muffin ones and the chocolate chip ones. I love the Little Bites Blueberry Muffins! We like the chocolate chip Little Bites. We love the mini blueberry muffins! The crumb cakes variety is my favorite! My favorite little bites are chocolate chip. I have never tried them but blueberry are my favorite muffins so I would probably try those first. The ultimate one is of course the blueberry muffins. I love the banana ones! I'm a big fan of the Banana ones and the Chocolate Chip ones! I love the strawberry yogurt ones but I think they were for a limited time. My favorite regular flavor is blueberry. The crumb cake or the strawberry yogurt. I'd love to try the vanilla! We love all the little bites! I have to find the vanilla ones! The blueberry muffins go with everything but we enjoy all them all! Thank you for this giveaway. I like to take one mini blueberry bit and one mini chocolate chip bite and eat them together. Chocolate and fruit is my jam, hahaha! I like the blueberry muffins and my kids like brownie bites. My favorite are the chocolate chip! Yum!! my family loves the chocolate chip! My favorite is the chocolate chip muffins. Thanks for the chance to win. My favorite are the brownie bites! They have been my favorite since I was a kid! My favorite Little Bites variety is Blueberry. My favorite ones are brownies bites. Chocolate obsessed I love the brownie bites!! My favorite flavors are anything with berries. I like blueberry or raspberry. Chocolate chip is a favorite with my kids! Favorite is the chocolate chip. This new vanilla is my favorite. Birthday Cake is my next in line. R.A. I like the blueberry muffins and would like to try the party cakes! My favorite is Blueberry! My daughter eats the Blueberry Little Bites faithfully every morning! I love the Blueberry Muffins! I love Banana nut muffin. My son loves the blueberry! One of my favorites is the Crumb Cake. The Fudge Brownies are my favorite. I do love the Crumb Cakes. My favorite variety of Entenmann's Little Bites are the Crumb Cakes. Little Bites Fudge Brownies are the best!! My favorite Little Bites flavor is Chocolate Chip. My family loves the Chocolate Chip muffins. Always the blueberry muffins! YUMMMMM! please bring back the brownie bites - without them, banana nut is my fave! I like their brownie bites! The blueberry ones are my favorite! I most like their chocolate chip muffins! Banana is my favorite flavor. Chocolate chip is my favorite. My daughter loves the party ones. Blueberry and banana walnut! Love these! I love the party cake ones! My favorite is the blueberry flavor. I LOVE the blueberry muffin ones with a fresh glass of orange juice. The best thing in the morning! Entenmann's Little Bite's party cake with a cup of English breakfast tea. Blueberry is my favorite Entenmann's Little Bite's. Nothing better with my morning coffee! I love the chocolate chip ones! All of them r pretty good, but for me it’s anything chocolate made by Entenmanns.